Presented by Comedy Central, the festival featured an intriguing mix of high profile local and international comedians including Rose Matafeo (Funny Girls), Paul Foot (Never Mind the Buzzcocks), Guy Williams (Jono and Ben), and Comedy Central’s own Rony Chieng (The Daily Show). The festival arrived with a lot of fanfare and expectation via seemingly endless plugs on television and social media and although the show was brand new, the consistently brilliant line-up and venue (the ASB Theatre is a great venue for a comedy show) make me how that this event will be a mainstay on New Zealand comedy scene. The night kicked off with Guy Montgomery. The moustachioed MC got the ball rolling right away, launching into rambling anecdote after anecdote with a pleasingly frenetic pace and urgent energy. You never quite know what you’re going to get from Montgomery (that’s all part of his charm) as he weaves in and out of what can best be described as comedic stream of consciousness. The comedian, perhaps best known for his internationally lauded podcast, The Worst Idea Of All Time, was a great choice of MC for the festival. His quintessentially Kiwi persona offered a strong contrast to the international guests (hailing from the US, UK, and Australia), while his high energy delivery helped balance out some of the more deadpan acts (such as Angella Dravid and Alice Snedden). The first act of the night was comedian, TV personality, and our second ‘Guy’ of the night, the one and only Guy Williams. Those that know him best from television will have expected the loud charm and quick-fire jokes that he brings to Jono & Ben, though as Jenanne pointed out, they may have been caught off-guard by his heavily political set that covered everything from Trump and Jacinda, to racism and immigration. While all the local acts on display delivered on the night, there were a few big highlights for me were Alice Snedden (it’s hard not to be won over by her impeccable writing and sardonic wit), Mel Bracewell (her self-deprecating quips of dating while being awkwardly tall had me in stitches), and Rose Matafeo. Matafeo’s performance deserves special mention. Her effortless charm and spot-on comedic timing ensured that she went down as one of the highlights of the night. Rose was probably Jenanne’s favourite Kiwi comic on the night, calling it “the perfect act”. She particularly loved the Michael Jackson-inspired lip-sync. Rose Matafeo is a comic on the rise and last night provided further evidence to why she’s crushing it over in the UK (not that we needed any). Angella Dravid and Two Hearts (Laura Daniels and Joseph Moore), rounded off the remaining Kiwi acts. Dravid took home the prestigious Billy T Award at last years New Zealand International Comedy Festival and fans of her deadpan delivery and anxious persona would have likely enjoyed her set. While not a polarizing comic by any means, neither Jenanne nor I seemed to connect with the performance with Jenanne going as far to say that she spent more time feeling uncomfortable than laughing. Two Hearts comic-pop act provided welcome contrast from the standard stand-up fare and they were certainly having a lot of fun on stage (their energy was infectious). Their writing is always great (especially a song which sees Daniels’ waxing lyrical about the late Alan Rickman), but I did find that of all the acts, their performance was probably least suited to the venue and could have benefited from the smoke and lighting effects that usually accompany their set. Jenanne commented later that while she enjoyed the set very much she felt it plateaued quickly. The internationals included Ronny Chieng (the best on the night), Ray Badran (blokeishly charming), Sam Campbell (more miss that hit for me), and Paul Foot (charmingly surreal). Ronny Chieng was the pick of the bunch for Jenanne and I. Ronnie is a seasoned pro and benefited from his time spent in the Melbourne comedy scene which enabled him to quickly read the room and get the audience onside throughout his criminally short set. His misanthropic demeaner and penchant for a tirade (mostly at the expense of the United States) had Jenanne and I in stitches and you could tell that Ronnie was enjoying himself out there and was audibly disappointed to find out that his time was up – we could have kept watching him all night. Ray Badran is unapologetically Aussie and his blokey demeanour was warmly appreciated by the crowd. Badran has a sort of pleasing aloofness which saw him muse about the everyday oddities of everyday life. Badran did enough to make me want to see how he’d handle an hour-long set. We were both impressed by what we saw. Jenanne wasn’t as impressed by what we saw from Sam Campbell though. Ever the diplomat, I could see how his “loose” delivery could work for a lot of people – enough people to see him nominated Best Newcomer at the Melbourne International Comedy Festival – but honestly, it fell flat for me. Talking after the show, Jenanne’s take was a little blunter: “He seemed way out of his depth out there. I would have thought he was an amateur if I hadn’t googled him just now”. The night wrapped with the enigmatic Paul Foot (UK) whose impish delivery and ridiculously surreal musings has seen him build a cult following around the world. At this point in the night Jenanne had a migraine so wasn’t really paying attention to what was happening, but I for one loved his mix of surreal observational comedy. Prancing around the stage, his beguiling stand-up had the audience equal parts confused and amused. Leaving the show, thoroughly entertained, we could only marvel at the diverse range of comedians that Comedy Central had pulled together. There was a little bit in there for everyone to enjoy and enjoy it we did. 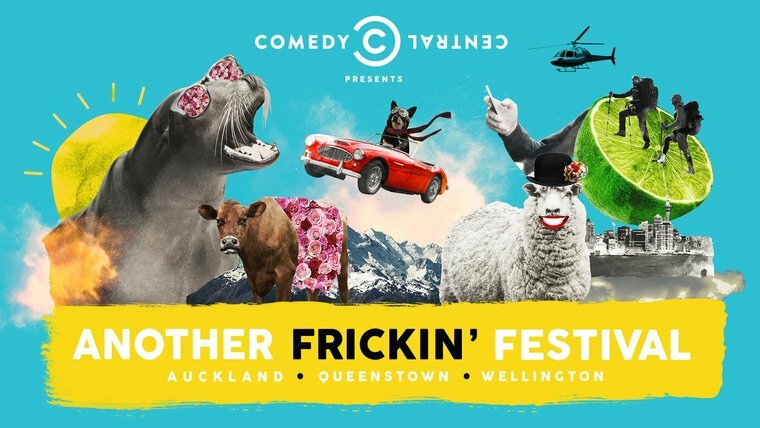 ‘Another Frickin’ Festival’ heads down to Queenstown tonight, playing venues across town over Friday and Saturday before wrapping up in Wellington at the Opera House on the 11th.